Good morning and happy Sunday. 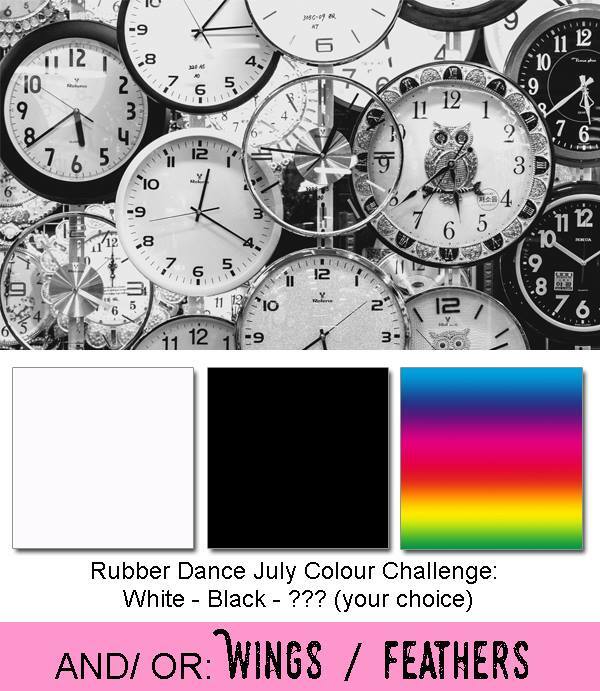 It's time to share the second round of inspiration for our challenge at Rubber Dance. 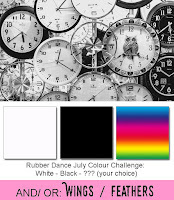 This month it's black and white plus one other colour, and/or wings/feathers. 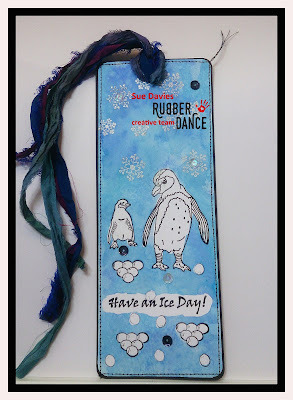 I've gone a bit 'old school' and made a bookmark. My son came home with a request - his girlfriend would like a bookmark. I must admit my first thought was 'would she like an e-reader for Christmas' ('cos I never know what to get her) but no, she likes 'proper' books! She has a cat, so I thought I would make one with a cat on, but no - she also likes penguins. Well duh, - who doesn't like penguins?? So penguins it is! I stamped Mum (or Dad) and baby (or just very small) penguins from the Playful Penguins set, along with the sentiment. Then I added some snowballs from the Whimsical Winter plate. Then I painted my images with masking fluid so the I could colour the background. I used blue Distress Inks, and dipped and dried. When everything was dry I gently removed the masking fluid, and stamped and embossed the snowflakes from Whimsical Winter. Then I just matted onto a piece of black card, added the black, white, and blue sequins, and some sari ribbon. By now I really didn't want to give this away, but I was a big girl and sent it on it's way. I hope that you join in with our challenge, all of the stamps can be found here. 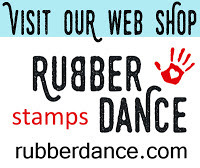 As always for free worldwide P&P on orders of 15 Euros and above just quote SDFreeShip at the Rubber Dance checkout. She will LOVE it ! I am sure! If not it's all her own fault! I love it -- refreshing and so cute!